There are 3.7 billion e-mail users in the world as of 2017. About 233 million of them are located in the United States. It was estimated that the number of e-mail users in the U.S. will reach nearly 255 million by the end of 2020. E-mail is likely to remain one of the main marketing channels in the country. Roughly half of the marketers in the U.S. intend to increase their spending on e-mail marketing, and about 48 percent are expected to maintain their budgets. In line with this projection, e-mail advertising spending in the U.S. is expected to increase from 270 million U.S. dollars in 2015 to 350 million U.S. dollars in 2019. As of June 2016, the world’s leading method of motivating customers to subscribe to e-mail messages by online retailers was through the offering of the latest news and brand content. Some of the roles marketing e-mails play in the consumer purchase process in the U.S. include: the provision of additional incentives to purchases, brand awareness, help in selecting products, and as reminders for purchases that need to be made. What is more, consumers commonly cite e-mail as the preferred method in which brands and companies should contact them. 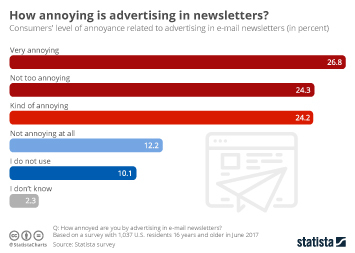 All in all, roughly a third of U.S. consumers think e-mail newsletter ads are helpful, with 56 percent claiming the opposite. According to 2017 e-mail marketing usage data, healthcare and travel were the two sectors where marketers reported having fully incorporated this tactic into their promotional strategies. For nonprofits, publishing and media, and B2B services professionals e-mail marketing usage circled around 90 to 96 percent. In a 2016 survey, 63 percent of marketing professionals stated that their companies will be investing in e-mail technologies, solutions or services in 2017, and in another survey among local businesses in the United States, 34.3 percent of respondents stated that they experienced a “good” return on email marketing investment. Moreover, according to online retailers, personalization and segmentation are two of the most successful e-mail tactics that drive conversion. In 2016, personalized messages had an 18.8 percent open rate, compared to a 13.1 percent open rate for non-personalized e-mail. Click rates also fared better for personalized vs. non-personalized messages, at 2.1 and 1.9 percent respectively. Lastly, as the number of mobile internet users continues to grow in the United States and more e-mails are being read on mobile devices, marketers have been seeking for the best means to integrate mobile with e-mail use in their marketing approach. Some of the common planned formats of mobile e-mail marketing integration worldwide include the use of mobile push, mobile SMS, as well as mobile MMS.